I would like to go through my previous articles on Basics of Node.js with Express Framework. 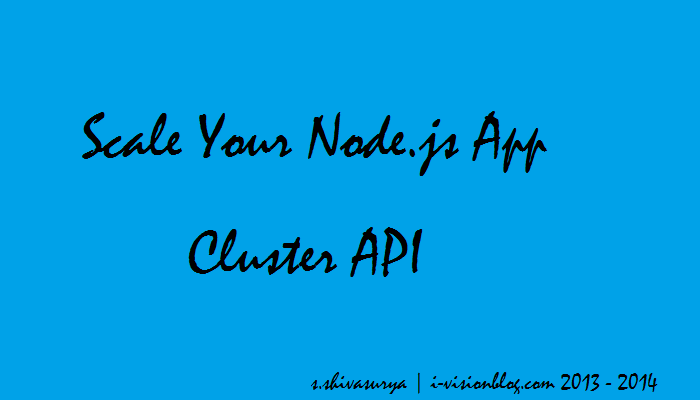 Cluster API is Inbuilt Feature of Node.js ,We are just Going to test in our app and use it out.However use it with caution since it is marked as Experimental Feature till Right now. Here we are creating a new Worker from master Cluster and working with the Workers,Generally you can fork process based on availability of processor.And if you like to fork even more,just Go through this Stackoverflow Thread.So,your Workers will handle your works automatically to load your balance. we check it is master process or not and forking process as worker as do our specified operation to respond the client. And with else you can write your application logic here to run with worker and respond to client.here you can notify the master thread with IPC and cmd.however we will do some basic operation over it. Now lets test with Siege tool.Download it from here appropriate operating system install it or extract and use. use the command as below with your own options to check out the efficiency for our small app. ** Preparing 1500 concurrent users for battle. The main thing is to scale the application both Horizontally and vertically.this can be achieved not only by clusters,you can run it in seperate VM's for more scalling.I am too looking for such experience and article. Hope you Learnt Something quite useful.For Errors/Bugs/hugs/suggestion comment below or mail to s.shivasurya@gmail.com or connect with me in Facebook/Twitter/Linkedin/G+ hangouts.share is care. thank you! hope this would have introduced what is cluster in node.js!